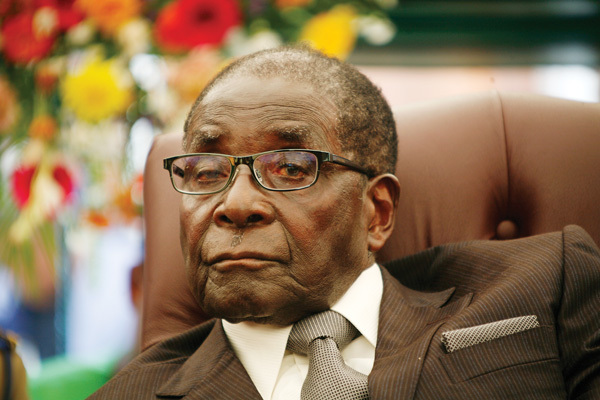 Mugabe has faced criticism in the past for taking an expensive vacations to other countries. However, his latest month-long vacation to Singapore and other Asian countries comes at a particularly crucial time as other Zimbabwe leaders recently had to ask neighboring countries for cash donations to help provide food for people suffering from a drought. Starvation in the country has become so severe that some residents have started consuming toxic locusts due to food shortages. Aside from the president spending close to $6 million by the time he returns to the Zimbabwe, according to Thursday reports, he also failed to sign off on December salaries of his administration’s employees before he left. Mugabe, who has traveled to Singapore for treatment for his eye cataract, took off back in December and brought along his entire family, including his wife Grace Mugabe, their four children, his in-laws and a team of security guards while several members of Muguabe’s staff didn’t receive payment in the month of December. The president also failed to pay annual end-of-year bonuses. Mugabe’s latest trip comes during Zimbabwe’s worst economic depression since 2009. Cash shortages have resulted in Zimbabwe’s market dropping down to 0.6-percent in 2016, according to news site New Zimbabwe. The country’s deteriorating economy has led to some Zimbabweans living off salaries as low as $1 a day. There are many reasons behind Zimbabwe’s failing economy, including the fact that the country has struggled to reboot their agricultural system following severe droughts in 2014 and 2015. However, some Mugabe critics blame unnecessary spending on the government’s behalf for economic struggles. Former Zimbabwe Prime Minister Morgan Tsvangirai, who currently leads the Mugabe opposition group, Movement for Democratic Change, recently condemned the president for taking a pricey holiday while the country was “burning,” Zimbabwe’s News 24 reported.